I made peanut butter cookie dough twice. I got the recipe from searching online, so I'm fairly sure it's a good recipe (one of the to search results). The first time, I put half a cup of peanut butter instead of butter (as instructed), refrigerated the dough overnight, and it became really gravel-like and crumbly; difficult to form into cookies. Thinking it was a lack of peanut butter, I made it again with a full cup of peanut butter the second time; same results. Thinking more, it's probable that the peanut butter is hardening in the fridge, which is where I'm storing the dough. Is there anything I can do about this? How do I make the dough more malleable? Experimenting with recipes is great, but on the first pass it is usually best to stay with exactly what the recipe says unless you are adjusting for altitude or another standard substitutions. In truth, it is why we usually look up recipes to begin with, to start with something others have found to be tried and true. I experiment and substitute all the time myself, but try to keep it like items with similar qualities, but maybe a taste a little more to my liking. PB and butter have very different qualities and a straight one for one swap in a recipe where they are major ingredients are like to not be the results you want. Call it a lesson learned and try it as written would be my suggestion. If you want more PB punch, add a bit extra, but keep the butter in. I have seen recipes without an additional fat, but typically they would call for a much shorter cook time and likely would produce a cookie that is drier and crumbly even then. Most PB cookies I have made or had tend to me to have a dry taste, even when visibly not dry, and this increases quickly when even slightly over-cooked, and that is without removing a key ingredient. I've made a ton of peanut butter cookies. I use the Cook's Illustrated recipe (behind a paywall, sorry) which is amazing. It's designed to enhance the peanut flavor by adding additional salt and using chopped peanuts in addition to extra chunky peanut butter (they specifically recommend Jif brand). Your recipe, based on mine, is all wrong. Mine uses twice that amount of butter (two sticks, salted) and sugar (one cup each of white and light brown) for the same amount of flour and eggs. It uses a cup of extra crunchy peanut butter in addition to the butter. I don't think you can blame the peanut butter alone for the grainy texture, though. It's likely a lack of moisture content because a half cup or even a full cup of fat really isn't a lot when it comes to 2.5 cups of flour. When you refrigerate dough, it loses moisture - fridges dry things out - so whatever small amount of moisture you had is reduced even further. Chilling cookie dough is certainly a good way to restrict the cookie's spread but overnight is probably a bit of overkill. This article from King Arthur Flour states that as little as 30-60 minutes is more than enough time to combat spread and chill the dough. 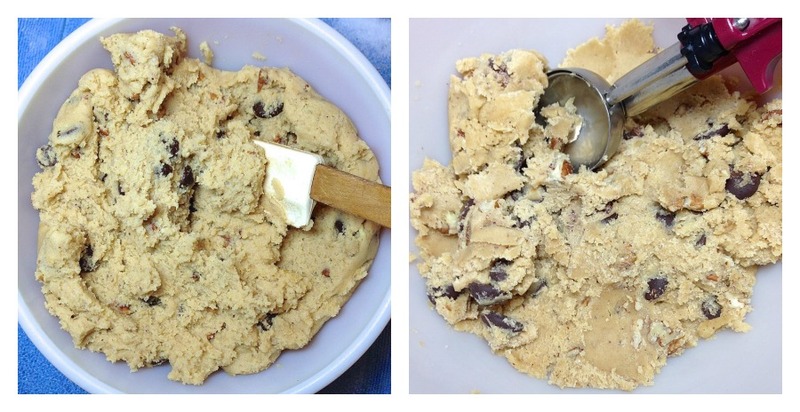 The longer you chill cookie dough, the smaller the changes become. Call it the law of diminishing returns. The major difference is between no chilling at all vs. chilling for 30 minutes. After that, the baked cookie continues to evolve – though very gradually. That’s fresh dough, at left; three-day-old dough, at right. The longer the dough chills, the drier it becomes. As a note, the recipe used for the test above (for chocolate chip cookies) is here. It uses 2 c flour, 1 egg, 1-1/3 c sugar (half and half white and light brown), and a full cup of fat (half butter, half shortening). Not the answer you're looking for? Browse other questions tagged cookies peanut-butter or ask your own question. How to solve under-baked cookie centers?